A new research report, titled “Head Mounted Display Market - Global Industry Analysis, Size, Share, Growth, Trends and Forecast 2014 - 2022”, from Transparency Market Research (TMR) states that the global head mounted display market is projected to expand at a remarkable 45.20% CAGR during the forecast period from 2014 to 2022. In 2012, the global head mounted display (HMD) market was worth US$430.4 mn and by 2022, the market is expected to be worth US$20.4 bn. The global head mounted display market is driven by the rising demand for lightweight HMDs, which will expand their application base. In addition to this, the declining prices of microdisplays and regulated demand from defense services will also fuel the global head mounted display market. On the other hand, the global head mounted display market will be suppressed by the design issues associated with HMDs and lack of awareness of the public regarding HMDs. By end use, the global head mounted display (HMD) market is segmented into the consumer market (video gaming, virtual reality, and augmented reality), defense (navy, military, and air force), and others (sports, safety practices, medical practices, and automation). In 2013, the defense service segment held the largest share in the global head mounted display market, generating a revenue of US$483.2 mn. On the other hand, the consumer market segment is projected to witness the fastest CAGR of 53.20% during the forecasting horizon. According to type, the global head mounted display (HMD) market is divided into wearable computing glasses and helmet mounted displays. The helmet mounted displays segment dominated the global head mounted display market with a 66% revenue share in 2013. Nevertheless, the wearable computing glasses segment is projected to surpass the helmet mounted display segment. Component-wise, the global head mounted display market is classified into pico projectors, computing, batteries, head trackers, control units, goggles, relay optics, accessories, and others. On the basis of application, the global head mounted display (HMD) market is divided into imaging, tracking, training and simulation, and security. 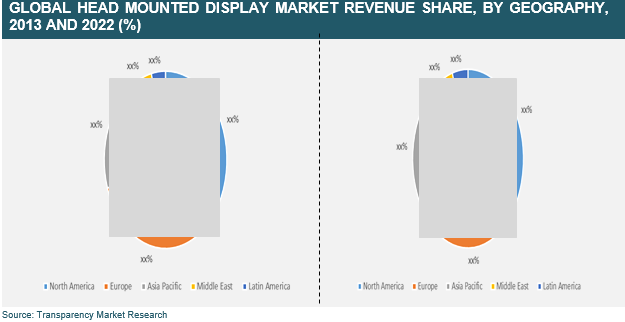 Region-wise, the global head mounted display market is segmented into Latin America, Asia Pacific, the Middle East and Africa, Europe, and North America. Currently, North America is dominating the global head mounted display (HMD) market. However, it is Asia Pacific that is predicted to experience the highest CAGR of 48.20% during the forecasting horizon. The Asia Pacific head mounted display market benefits from the growing demand from its medical sector and consumer sector. The global head mounted display market is projected to witness growing demand in the medical sector for various types of surgeries and dentistry practices. Companies in the global head mounted display (HMD) market will benefit from the opportunities presented by cloud computing. Another good growth opportunity for market players is the use of HMDs in automotive prototyping, i.e. virtual designing of automotive parts. The key companies operating in the global head mounted display market are BAE Systems, Google, Elbit Systems, Seiko Epson, eMagin, Sensics, and Sony.